The first Gay Geek Dinner was held last recently, and I had an enjoyable time and got to meet new people. We ended up with eight people in the end, which worked well for chatting together. We met up at Mighty Mighty, with it's great ambiance. Something I hadn't thought about was how strangers could meet each other in what eventually was a busy bar, but we managed. The Google t-shirts, discounts cards for Moo, and Armageddon swag were all well received. Having a non-geek partner, who doesn't understand the fascination with any of the above. When time came for dinner, i.e. a few people asked when were we eating, we moved on to Southern Cross. 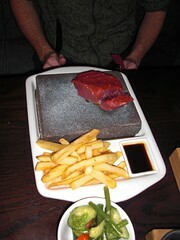 Food geeks would love the way steaks are served, on a sizzling hot stone. As we finished eating, the live music that started playing wasn't to our tastes so wandered back to Mighty Mighty for an after-dinner drink, losing three diners in the process. The evening finished with hot chocolate at Ernesto, being waved at by friendly cops stopped at a red light. All-in-all an enjoyable evening for the first Gay Geek Dinner, meeting people with similar interests. Many thanks to Brian for sharing his experiences with us. We look forward to hearing more about future meetings.